You Must Print and Bring your Express Entry Ticket Confirmation to Gain Expedited Entry from the Middle Rope! - Must be at least 21 years old to access stage. - You must print and bring your ticket confirmation to gain expedited entry from the middle rope. - Claim your stage access credentials at the stage entrance inside the venue. - Claim your merch pack at box office window. - Merch pack includes: set of four (4) pins + one (1) lanyard. On May 10th, AVALON Hollywood will welcome a pair of heavy-hitting electronica acts for another edition of CONTROL Friday. 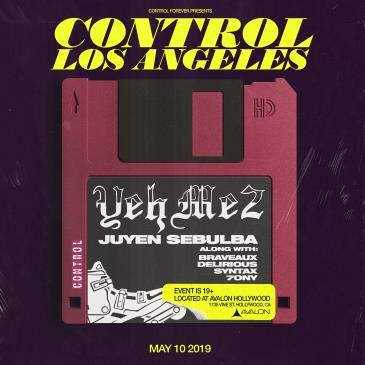 YehMe2 and Juyen Sebulba will be your party hosts for a night of new-wave dance music and nonstop fun, featuring local support from Braveaux, Delirious, Syntax, and 7ony. Josh Young, better known as YehMe2, keeps crowds on their toes with a refreshing mix of trap, house, and electronica production. The former Flosstradamus member spent the better part of a decade working with artists like Post Malone, Waka Flocka Flame, and Dillon Francis en route to becoming one of the most successful duos in dance music. Now, YehMe2 is riding solo and hitting stages across the world with his genre-transcending sound. Joining YehMe2 is Juyen Sebulba who fuses hardstyle electronica with deep bass production to create an unmistakable modern house sound. The Dallas-born DJ released his first single ‘Superjam’ off the Mad Decent label as a 21 year old in 2013 and has since grown to become one of the most prolific young acts in dance music. CONTROL Friday will also see a cast of local supporting talent. Braveaux complements YehMe2’s trap-inspired sound with nonstop basslines and seamlessly mixed samples. Delirious comes in with even more trap vibes, and Syntax and 7ony switch things up with groovy deep house mixes. Grab your tickets for May 10th now and catch YehMe2, Juyen Sebulba, Braveaux, Delirious, Syntax, and 7ony at AVALON Hollywood on CONTROL Friday! Ticket(s) purchased via this website may be claimed at the WILL CALL desk at AVALON only on the night of the event. Please bring the credit card used to purchase the ticket(s) along with a valid PICTURE ID documenting that you and your guest(s) are at least 19 years of age. TICKETS MUST BE CLAIMED BY 11PM to guarantee IMMEDIATE ADMISSION. We will hold space for everyone who claims their ticket(s) before 11PM. 19 ID and credit card used to purchase the tickets along with a printed confirmation.